Is this pizza-thread a special RUA way to celebrate Maslenitsa? My only experience with Moscow pizza was at a pizzaria near Avtozavodskaya station. It was quite good although a bit pricey. Thin crust, quality toppings and just the right amount of sauce. Mayonnaise instead of sauce was popular in the Detroit area about 20 years ago. It was called a BLT pizza, like the sandwich. It was a novelty and tasted ok but I don't see it much anymore. For my money nothing beats a regular crust, Italian sausage and onion. This came up in chat. Anybody experienced this? I have a little experience in this having lived in Buenos Aires for several years as well as Uruguay where it is the same. There are several things that make beef from Argentina, Uruguay, and Southern Brazil better than any other place on the planet. First is the breed of cow. The correct breed will make a huge difference in the quality of beef. In Central America they raise mainly Brahman cows which are resilient to jungle diseases and pests, but the quality of beef is not great. Argentina is further south so they are able to raise better breeds more conducive to quality beef. In fact they are obsessed with breeding and have numerous very unusual breeds down there like the horses which are no taller than chickens. The US is north so we are able to raise similar breeds in our climate. Another reason Argentine beef is superior (and not sure if still the case but most likely) is the cattle are free ranged. 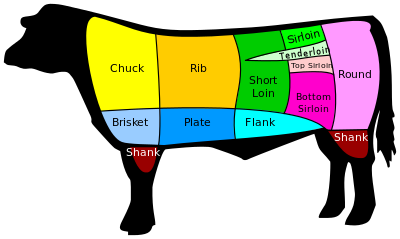 Now the real reason the beef is so damn good down there is mostly unknown. My grandfather was a rancher his entire life. He free ranged 400 head of cattle on organic alfalfa, rotated fields, had the best breeds, etc. His beef should have been as good as the beef in Argentina you would think. Well, the key difference is that they butcher the beef differently in Argentina (Uruguay, Southern Brazil). They have entirely different cuts which cook better than ours. It is similar to the way the French or Chinese cut their vegetables at angles so the cook more efficiently. We tend to cube our cuts of beef instead. On my last visit to Tashkent I took the family to the pizza place that was supposed to serve "American style" pizza. I do not remember the name of the place, but it was close to the train station. ~The decor of a restaurant was close enough to an American style that I would give it a pass. Certainly Pizza Hut-esque. The best pizza I have ate in the FSU was in Tashkent at, Pizzeria Bella Napoli. It has a nice selection of food, and is nicely furnished. Another place I went to regularly was Pan Pizza in Odessa. The pizza was semi good, nothing to make one question WTF are they doing, it was priced right, and served right. Tasted pretty good if I remember correctly!